Proteins help to regulate almost every process in the body, and come in various forms, sizes and purposes. Cells contain thousands of different proteins, but not every protein is needed at all times. To create new proteins, the information on a gene first needs to be transcribed into RNA (template molecules of the DNA) in a process known as transcription. A complex machinery inside the cell then uses the copy as a template to assemble the protein. So-called transcription factors (also proteins) can switch the copying process on or off by binding to the start point of a gene. They can act alone or in complex with other proteins. The transcription factor called ASCIZ, for example, helps to regulate the production of a protein called LC8. LC8 attaches to more than 100 different proteins and plays an important role in many cell processes. Therefore, fine-tuning its production is essential. The shape of a protein is critical to its purpose. Like most proteins, transcription factors are made up of chains of amino acids that fold into a specific three-dimensional (3D) structurewith a region that recognizes and binds to a specific DNA sequence. But many transcription factors also contain flexible, ‘disordered’ regions that do not fold into a rigid 3D shape. These may help to control the activity of genes, but their exact role is unclear. ASCIZ contains an exceptionally long, disordered region that has multiple positions for binding LC8 along its chain. Previous research has shown that ASCIZ binds to the LC8 gene and increases transcription to produce more LC8 proteins. Once the protein levels are high enough, LC8 is thought to bind to the disordered region of ASCIZ and switch off transcription. Human ASCIZ proteins have 11 binding sites for LC8 molecules, while fruit flies have seven. Until now it was not clear why so many different binding sites exist. To address this question, Clark et al. combined biophysical, structural and molecular biology techniques to analyze proteins from humans and fruit flies and to test their role in human cells. This revealed that LC8 and ASCIZ form a dynamic mixture of complexes, instead of a single fully-occupied complex. As the number of LC8 molecules bound to ASCIZ increased, the rate of transcription dropped. However, all of the binding sites were rarely fully occupied. Instead, three to four attached LC8 molecules seemed to be sufficient to ensure that LC8 levels remain balanced. When the number of LC8 molecules exceeded this value, the attachment rate for additional LC8 slowed down. So, even when there was an excess of LC8, most of the human ASCIZ binding sites were only partially filled. This way, the production of LC8 proteins was slowed, rather than fully shut down. As a result, the cells were able to fine-tune the transcription rate of LC8 and maintain a stable and balanced pool of these proteins. This work suggests that disordered regions on transcription factors could help to keep cellular systems steady in the face of changing conditions. In the future, the combination of methods used here could reveal new information about other proteins with disordered regions. Regulation of transcriptional activity is essential for every biological process. Common mechanisms for regulation include post-translational modifications and/or cooperativity among multiple activators and repressors (Banerjee and Zhang, 2003). Some transcription factors contain multiple regulatory sites for either post-translational modifications (Meek and Anderson, 2009) or binding partners (Cantor and Orkin, 2002), and their activity is thus tuned by the combined action of these components. Recent studies have revealed a high degree of intrinsic disorder in transcription factors, indicating that the inherent dynamical behavior harbored by these structures is critical for these regulatory events to take place (Li et al., 2017; Liu et al., 2006; Minezaki et al., 2006). Our developing understanding suggests that the intrinsically disordered domains in transcription factors may provide a multivalent platform for the recruitment of regulatory binding partners (Currie et al., 2017; Shammas, 2017). While the functional consequence of multivalent binding to an intrinsically disordered region has been described for a few transcription systems (Dyson and Wright, 2016; Uversky et al., 2009), it remains unclear for the vast majority of cases. Human ASCIZ (ATMIN-Substrate Chk-Interacting Zn2+ finger) is an 88 kDa protein that has recently been identified as a transcription factor for the hub protein, LC8 (dynein light chain 8)(Jurado et al., 2012a). Mice with mutations in ASCIZ that prevent LC8 transcription die in late embryogenesis and exhibit serious developmental defects in kidneys and lungs (Goggolidou et al., 2014a; Goggolidou et al., 2014b; Jurado et al., 2010). Drosophila ASCIZ knockouts die in early embryogenesis and localized knockdowns using RNAi show mitotic defects (Zaytseva et al., 2014). Mutant phenotypes in Drosophila, developing mouse B lymphocytes, and cultured cells are rescued by ectopic overexpression of LC8, demonstrating that the observed defects of ASCIZ knockouts are due to ASCIZ regulation of LC8 expression (Goggolidou et al., 2014b; Jurado et al., 2012b; Zaytseva et al., 2014). In addition, it has recently been shown that a conditional knockout of LC8 almost perfectly copies the corresponding phenotypes of ASCIZ knockouts in mouse B cell development and B cell lymphomagenesis (King et al., 2017; Wong et al., 2016). LC8 is a highly conserved 20.6 kDa protein homodimer (10.3 kDa monomer) that facilitates self-association of its primarily disordered partners (Barbar, 2008; Barbar and Nyarko, 2014; Clark et al., 2015) (Figure 1a). LC8 binding is associated with a range of cellular processes, from cell division to apoptosis, underscoring LC8’s essential role as a regulatory hub (Dunsch et al., 2012; Puthalakath et al., 1999). LC8 preferentially binds to a 10-amino acid motif in intrinsically disordered regions (IDRs) containing highly conserved TQT residues at positions 7–9 (Barbar, 2008; Rapali et al., 2011b) (Figure 1b). In complex with LC8, the otherwise intrinsically disordered motif adopts a ß-strand conformation (Benison et al., 2007; Liang et al., 1999) (Figure 1a,b). Analysis of the 11 crystal structures of LC8 bound to short peptides containing the motif explains why the TQT residues are essential for binding: the Q is involved in interactions with both LC8 subunits in the dimer, while both T’s are fully buried and thus evolutionarily constrained. In these interactions, TQT acts as the motif anchor while the other seven highly variable motif residues modulate affinity, as described in the anchored flexibility model of LC8 motif recognition (Clark et al., 2016). LC8 binds one motif in each of its two symmetrical binding grooves (Figure 1a), creating an IDP duplex that serves as a bivalent scaffold. This scaffold aids in higher order complex assembly by promoting binding of other proteins, including additional LC8 dimers (Figure 1c), and enhancing self-association and oligomerization processes that often involve coiled-coil formation (Hall et al., 2009; Kidane et al., 2013). In recent years, the number of experimentally characterized LC8 partners has risen to more than 40, and prediction methods indicate that dozens more may specifically bind LC8 (Rapali et al., 2011b). Gaining insight into how LC8 interacts with partner proteins, and how LC8 levels in the cell are balanced, is therefore paramount to understanding the regulation of many cellular processes. (a) Ribbon diagram of dimeric LC8, where each monomer is colored a different shade of blue and bound to a representative peptide in yellow (PDB 5E0L). A single LC8 dimer binds two peptides (intrinsically disordered region, IDR), one on each side of the dimerization interface, that are arranged in a parallel fashion. (b) A sequence logo of LC8 binding motifs derived from sequences of the motifs in the 11 crystal structures reported for LC8/peptide complexes. Height of amino acids indicates their relative frequency at that position. (c) A crystal structure of two LC8 dimers bound to two copies of the same intrinsically disordered chains illustrates how LC8 can bind to multivalent partner proteins with two LC8 recognition motifs, TQT1 and TQT2 (PDB 3GLW). (d) Sequence-based predictions of order (red boxes), disorder (blue lines), and LC8 binding motifs (dark blue bars) are shown for 10 ASCIZ proteins from the animal kingdom. ASCIZ proteins for different species were identified from a BLAST search (Boratyn et al., 2013) against the human protein. Sequence predictions of order and disorder were obtained with PSIPRED (McGuffin et al., 2000), where a criteria for order is based on >10% probability of predicted structure in a 50 + amino acid stretch. LC8 binding sites for human ASCIZ and Drosophila ASCIZ were obtained from the literature (Rapali et al., 2011a; Zaytseva et al., 2014). Putative LC8 binding sites for the other species were identified based on the presence of TQT residues. A distinctive feature of ASCIZ is the high number of LC8 recognition motifs within its C-terminal domain. Although some LC8 partners have multiple recognition motifs (Dunsch et al., 2012; Fejtova et al., 2009; Gupta et al., 2012; Stelter et al., 2007) (Nucleoporin Nup159 has 5, Chica and Bassoon each has 3), human ASCIZ contains 11 functional LC8 binding sites (Rapali et al., 2011a), the most by far of any partner protein identified to date. 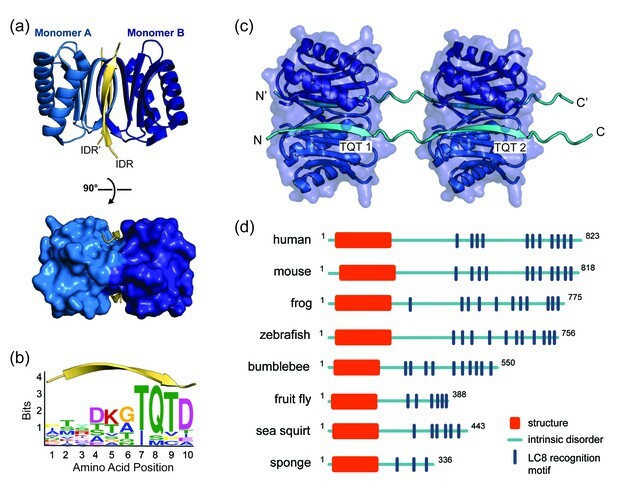 This enrichment in LC8-binding sites is conserved throughout the animal kingdom, underscoring the importance of multiple motifs in ASCIZ function (Figure 1d). Cell culture transcription assays demonstrate that ASCIZ regulates LC8 transcription via a system of negative autoregulation, for which the mechanism is not well understood. Disruption of the ASCIZ/LC8 interaction via mutation of the TQT sites results in an increased level of LC8 transcription, while overexpression of LC8 decreases transcription (Jurado et al., 2012a). This observation led to the hypothesis that ASCIZ acts as a sensor for cellular LC8 and regulates LC8 transcription levels according to cellular needs (Jurado et al., 2012a). As LC8 expression levels vary among tissue types (Chintapalli et al., 2007) and LC8 overexpression enhances the survival and proliferation of breast cancer cells in culture (Vadlamudi et al., 2004), regulation of LC8 levels is critical for cellular health and homeostasis. However, while high levels of LC8 inhibit ASCIZ transcriptional activity (Jurado et al., 2012a), it is not known how this activity is controlled at the molecular level nor the requirement for multiple binding sites. In this work, we use a combination of biophysical, structural, and molecular biology tools to explore the relationship between ASCIZ multivalency and LC8 transcription. We show that human and Drosophila ASCIZ bind to multiple LC8 dimers simultaneously in both a positively and negatively cooperative fashion, enabling the formation of a dynamic equilibrium of complexes, of which low occupancy intermediates are highly populated. We propose that this dynamic ensemble of complexes is important for transcriptional regulation and validate the main aspects of our hypothesis via transcriptional assays with human ASCIZ. 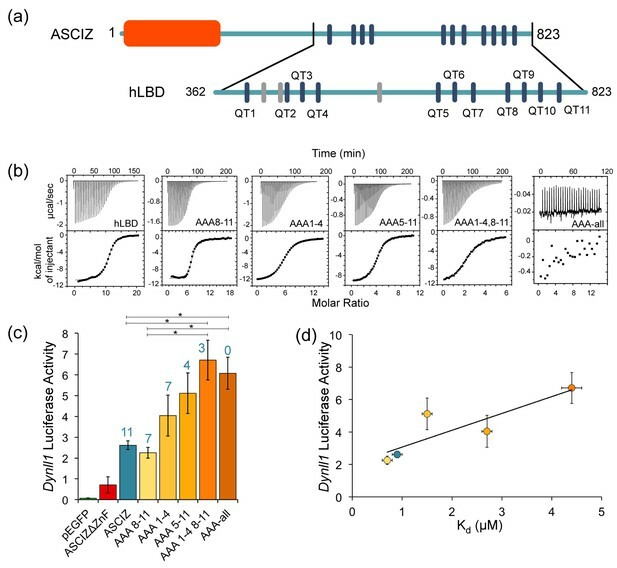 These observations support a novel model of autoregulation, whereby ASCIZ engages in a dynamic equilibrium of multivalent interactions that tune the level of ASCIZ transcriptional activity. The 45 kDa Drosophila ASCIZ protein, dASCIZ, is predicted to contain four Zn-finger motifs at the N-terminus followed by a 243-amino acid long region of intrinsic disorder. The disordered region has six predicted LC8 recognition sites identified by a canonical TQT motif (Figure 2a, dark blue bars): QT1 (residues 251–262), QT2 (274–285), QT4 (323–334), QT5 (340–351), QT6 (354–365), and QT7 (374–385). QT3 (285–296) lacks the TQT residues but is identified experimentally as an LC8 recognition site in this work (below). Purification of full-length dASCIZ is impeded by poor expression levels and insolubility, and therefore we designed and produced constructs corresponding to the zinc finger domain, dZnF (residues 1–156, red bar Figure 2a), and the LC8-binding domain, dLBD (residues 241–388, Figure 2a). (a) Domain structure of dASCIZ, showing the dZnF domain (red) and 7 LC8 binding motifs in its C-terminal domain (blue). Dark blue bars indicate predicted TQT motifs and gray bars indicate the TMT motif (QT3) identified in this study. (b) Sedimentation velocity analysis of the dZnF domain (red), collected at 10°C, and the dLBD (blue), collected at 25°C. (c) Far UV CD spectrum of the ZnF domain (red squares) and the dLBD (blue circles), both collected at 10°C. (d) [15N−1H]-BEST-TROSY spectrum at 850 MHz showing backbone assignments for 133 non-proline residues. Unassigned peaks correspond to the two additional N-terminal residues from the expression vector. The spectrum was recorded at 10°C. (e) A plot of secondary chemical shift differences versus residue number. ΔCα and ΔCβ values were calculated by subtracting the random coil chemical shifts (Tamiola et al., 2010) from the experimentally determined. ΔCα − ΔCβ values < ±1.0 ppm are considered not significant. (f) Plots of R2/R1 and (g) heteronuclear NOE values measured at 10°C indicate high level of disorder. A dotted line is placed at the average value to aid in visualization. Segments corresponding to LC8 recognition motifs, QT1, QT2, QT3, QT4, QT5, QT6, and QT7 are shown. Additional structural characterization of the dLBD by circular dichroism and gel filtration chromatography is shown in Figure 2—figure supplement 1. Sedimentation velocity analysis of the dZnF and dLBD (Figure 2b) indicates that each is a monomer in solution with molecular weights of 17.4 kDa and 18 kDa, respectively (theoretical MW 17.6 kDa and 17 kDa). The CD spectrum of dZnF shows a large negative ellipticity at 208 nm and a small negative ellipticity at 222 nm (Figure 2c, red) indicative of a mix of alpha helices and loops, similar to CD spectra of other ZnF proteins (Ezomo et al., 2010). The dLBD CD spectrum has a large negative ellipticity at 200 nm, indicating that it is primarily disordered (Figure 2c, blue). From 5D NMR experiments, backbone assignments for 90% of the 148 residues in dLBD were obtained (Figure 2d). A high level of disorder in dLBD is revealed by the limited amide proton chemical shift dispersion in 15N HSQC spectra (Figure 2d), and a lack of secondary structure preference is further supported by small ΔCα-ΔCβ chemical shift differences from random coil values (Figure 2e). Together these data demonstrate that dASCIZ contains an N-terminal structured domain as well as a long intrinsically disordered domain, and constructs of each domain are monomeric in solution. Local dynamics of dLBD were assessed by NMR measurement of the 15N longitudinal (R1), transverse (R2) relaxation, and 1H-15N heteronuclear NOEs. R2/R1 values range from 1.5 to 5.3 with an average of 3.3 (Figure 2f). Relatively higher R2/R1 values for residues 321–363 suggest motional restriction in this region. Heteronuclear NOE values measured at 10°C are very low overall, with values ranging from −0.1 to 0.3, but are also slightly higher for residues 321–363 (Figure 2g). Together, the R2/R1 and heteronuclear NOE values imply that dLBD is highly flexible with slight motional restriction in its C-terminal half. The difference in flexibility between the N-terminus and C-terminus was validated by generating shorter constructs of the dLBD that include the first three (QT1-3), two internal sets of three (QT2-4 and QT4-6), and last four binding sites (QT4-7) (Figure 3a). All constructs are of a similar size, varying from 68 to 84 residues in length. Circular dichroism demonstrates that the C-terminal constructs, QT4-6 and QT4-7, are slightly more ordered than N-terminal constructs, QT1-3 and QT2-4 (Figure 2—figure supplement 1a). Size-exclusion chromatography supports this result, as the QT4-6 and QT4-7 constructs elute later, indicating that they are more compact than the N-terminal constructs (Figure 2—figure supplement 1b). LC8-dLBD interactions monitored by ITC. (a) Construct schematics of the dLBD, QT1-3, QT2-4, QT4-6, and QT4-7 are shown, along with the locations of each TQT motif. A representative isothermal titration calorimetry thermogram of LC8 with the dLBD is shown on the right. (b) Representative thermograms of LC8 with constructs corresponding to QT1-3, QT2-4, QT4-6, and QT4-7. (c) Representative isothermal titration plots of LC8 with peptides corresponding to QT1p, QT2p, QT3p, QT4p, QT5p, QT6p, and QT7p. Since the interaction with QT3p is too weak, the heat exchange with buffer is plotted on top to show the difference between QT3p with LC8 and buffer. Higher concentrations were not possible due to poor solubility of the QT3p. Data were fit to a single site binding model using Origin software. Isothermal titration calorimetry (ITC) experiments on dASCIZ constructs were applied to identify the number of recognition motifs and provide estimates of their overall binding affinity for LC8. A range of constructs containing three to seven recognition motifs were tested for their binding to LC8 and all display a single binding step (Figure 3). Thus the measured Kd and stoichiometry are ‘effective’ values that present an overall simplified picture of a much more complicated complex assembly process. The full length dLBD binds LC8 with a dLBD:LC8 stoichiometry of 1:7 (two chains of dLBD for 7 LC8 dimers) and an overall Kd of 1.4 μM (Figure 3a, Table 1), suggesting that an additional non-TQT ASCIZ site binds LC8. A plausible candidate is a TMT motif corresponding to residues 285–296 (designated QT3 in Figure 3a). To confirm the functionality of this motif, ITC binding of LC8 was measured for constructs QT1-3, QT2-4, QT4-6, and QT4-7 (Figure 3b). QT1-3 and QT2-4 contain the TMT binding motif, and both bind LC8 with a stoichiometry of 3, demonstrating that this TMT motif is the seventh LC8 recognition site (Figure 3b, Table 1). Each of the other two constructs bind LC8 with the stoichiometry expected from the number of TQT binding motifs. Interestingly, construct QT4-6, containing recognition sites 4–6, binds LC8 with a Kd of 1.0 μM, a slightly higher overall affinity than the full dLBD construct. QT4-7, on the other hand, binds LC8 with a 1.6 μM affinity and is slightly more entropically disfavored than either QT4-6 or dLBD (Table 1). The overall Kd values of QT1-3, QT2-4, and QT4-7, are 2.4 μM, 4.1 μM, and 1.6 μM, respectively. Thermodynamic parameters of dASCIZ-LC8 interactions. Given the small differences in binding affinity among the shorter dLBD constructs, we asked if any individual site binds LC8 with higher affinity than all others. A series of 14–15 amino acid peptides were synthesized, each corresponding to one of the seven recognition motifs, and their LC8 affinity was measured (Figure 3c, Table 2). The Kd values for all peptides indicate surprisingly weak affinity. QT3p interaction with LC8 is not even detected at 30 μM LC8. 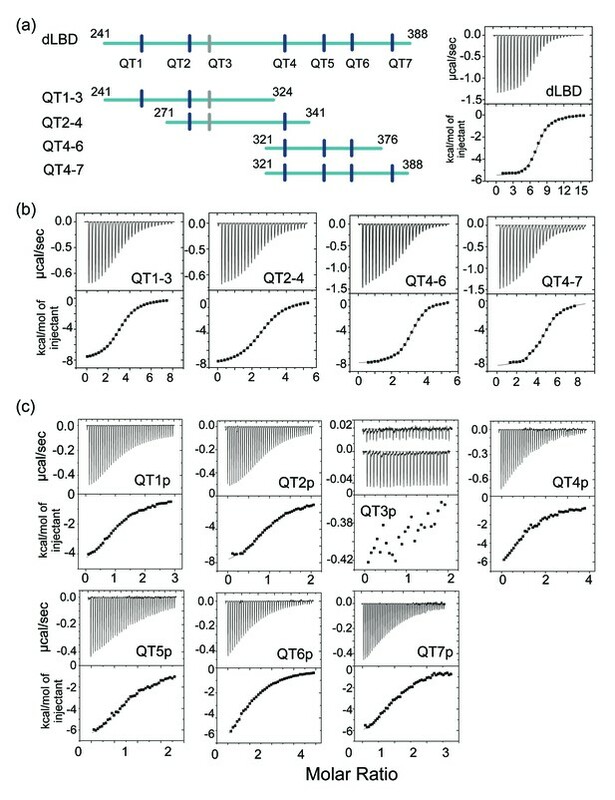 Intriguingly, the QT4-6 construct has a slightly higher binding affinity than the other constructs, while the QT4, QT5, and QT6 peptides display among the lowest affinity as individual peptides. These results indicate that positive cooperativity enhances LC8 binding to neighboring recognition motifs. Thermodynamic parameters of peptide-LC8 interactions. Since ITC experiments on the full length dLBD and smaller constructs identify 7 LC8 recognition sites, we sought to establish the size of the dLBD:LC8 complex at varying LC8 concentrations by analytical ultracentrifugation. The dLBD was titrated with increasing concentrations of LC8 and complex formation was assessed at dLBD:LC8 molar ratios 1:1, 1:3, 1:6, and 1:10. Plots of the continuous size distribution, c(S), vs. sedimentation coefficient (Figure 4a) show that titration at sub-saturating concentrations of LC8 results in a broad peak that is likely an equilibrium mixture of complexes with varying LC8 occupancy in exchange with each other and with free dLBD. At a saturating concentration of LC8 (1:10 ratio), a high occupancy complex whose size (7.5 s) approximately corresponds to a fully bound complex (197 kDa) is clearly evident. Contrary to expectations, a low stoichiometry complex (5 s, approx. 114 kDa) is even more highly populated. A high frictional ratio (f/f0 ~ 1.6) indicates an elongated complex, and the molecular weight of this low occupancy complex corresponds roughly to a 1:3 complex, although its broadness, and the approximate nature of the molecular weight determination, indicate that multiple species are present. It is likely that the low occupancy peak, which is roughly twice the intensity of the high occupancy peak, is a heterogeneous mixture of 1:2, 1:3 and 1:4 complexes. ASCIZ and LC8 form a dynamic complex with low occupancy intermediates. (a) Representative c(S) distributions obtained by sedimentation velocity are shown for the dLBD, LC8, and increasing molar ratios of the dLBD: LC8; 1:1, 1:3, 1:6, and 1:10. The standardized sedimentation coefficients (s20,w) of unbound LC8 and dLBD determined from sedimentation velocity are 2.42 s (frictional ratio, f/f0 = 1.21, consistent with a globular protein) and 1.34 s (f/f0 = 1.84, consistent with an asymmetric or unfolded protein), respectively. Calculation of the molecular weight from the sedimentation coefficient and frictional ratio gave masses of 23 kDa and 18 kDa respectively, closely matching their theoretical masses of 24 kDa for LC8 dimer and 17 kDa for dLBD monomer. Cartoon depictions of the ASCIZ dLBD (light blue) and LC8 (dark blue) are shown to aid in visualization of the complexes formed at a 1:10 ratio. (b) Native gel titration of dLBD with LC8. An increasing concentration of LC8 was added to a constant amount of dLBD, from a molar ratio of (dLBD:LC8) 1:1 to 1:8. As more LC8 is added, the complex migrates more slowly and excess LC8 appears at 1:4. (c) Native gel titration of hLBD with LC8. As an increasing concentration of LC8 is added to a constant amount of hLBD. Arrows indicate the locations of the low molecular weight (LMW) and high molecular weight (HMW) complex. (d) Titration of the hLBD with LC8, monitored by size exclusion chromatography on a Superdex 200 gel filtration column. The concentration of hLBD is held constant and an increasing amount of LC8 is added, from a molar ratio of 1:3 to 1:13. Peaks corresponding to free hLBD, free LC8, low molecular weight complex (LMW) and high molecular weight (HMW) complex are labeled. Additionally, SAXS data for the LMW dLBD:LC8 complex is shown in Figure 4—figure supplement 1. In summary, while high occupancy complexes are evident in AUC profiles, consistent with the ITC results, these complexes are in equilibrium with many smaller sub-saturated species, the most populated of which is a mixture of 1:2-1:4 complexes of dLBD:LC8. The low occupancy complexes are favored, relative to higher occupancy complexes, even in samples having a large excess of LC8. The presence of stable, low occupancy complexes is supported by small angle X-ray scattering (SAXS) data. A sample composed of dLBD and a large excess of LC8 was injected into an in-line size-exclusion chromatography system and X-ray scattering data were collected for the largest peak. Guinier analysis of the data indicates a monodisperse sample suitable for further analysis (Figure 4—figure supplement 1a). The distance distribution function suggests a moderately compact structure for dLBD:LC8 complexes, with Dmax = 240 Å, and a molecular weight of roughly 110 kDa, confirming the presence of an unresolved mixture of dLBD:LC8 complexes with stoichiometries ranging from 1:2-1:4 (Figure 4—figure supplement 1b). Additionally, a Kratky plot of the scattering data indicates that the dLBD:LC8 complex is a mix of globular domains and intrinsically disordered chains, consistent with low occupancy complex structures (Figure 4—figure supplement 1c). Native gel electrophoresis titration of dLBD with LC8 corroborates the presence of a mixture of complexes (Figure 4b). When unbound, dLBD and LC8 each migrate as a single band. When LC8 is added to dLBD at a 1:1 molar ratio, the band for free LC8 disappears, and the complexes formed migrate above LC8, as a diffuse band likely corresponding to two dLBD chains bound to two or more LC8 dimers (since some free dLBD persists). As the molar ratio is increased, the diffuse upper band becomes a dark smear, free LC8 accumulates in a pronounced dark band, and the free dLBD band disappears. We think the most likely explanation is that the decreasing mobility of the upper edge of the smear indicates increasing sizes of the complexes formed. Unbound LC8 is clearly visible at ratios ≥ 1:4, indicating that a pool of free LC8 accumulates even at conditions well below LC8 saturation of dLBD. We similarly assessed the gel mobility of complexes formed by LC8 and the LC8-binding domain of human ASCIZ (hLBD), which contains 11 TQT motifs (Rapali et al., 2011a) (Figure 1d). Very similar behavior is observed for hLBD, although the gel mobility of hLBD bands is much lower than the mobility of dLBD bands due to molecular sieving of the much larger hLBD (53 kDa) compared to dLBD (17 kDa). Molecular sieving is the dominate effect on hLBD mobility as both hLBD and dLBD are disordered and highly extended and have a pI of ~4. As LC8 is added to hLBD, the free hLBD band disappears and a lower mobility smear becomes increasingly evident. Decreasing mobility of the upper smear indicates increasing sizes of the complexes formed, while the appearance of a bands migrating the same as free LC8 at ratios ≥ 1:4 indicates the presence of a pool of free LC8 well below LC8 saturation of hLBD. Together the gel titration data for dLBD and hLBD suggest that hLBD:LC8 complexes form a dynamic ensemble with varying levels of LC8 occupancy in which lower occupancy forms are favored. 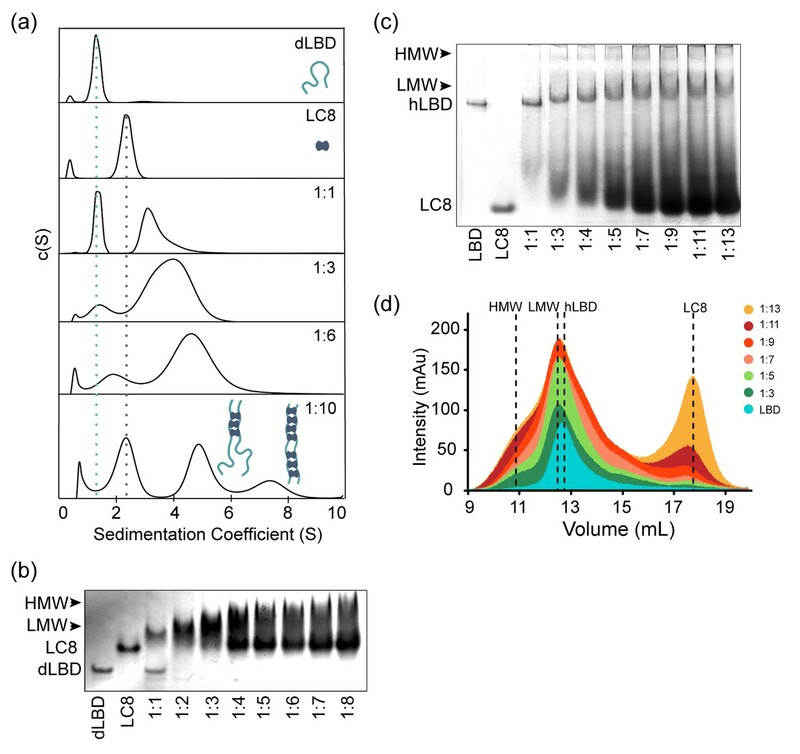 Titration of the hLBD with LC8 by size-exclusion chromatography (Figure 4d) supports our interpretation of the native gel experiments in Figure 4c. Here, the amount of hLBD is held constant, and increases in peak intensity are due to effects on hLBD complexes from increasing LC8. Both LMW and HMW complexes form at the first titration point and increase in population as more LC8 is added. A low occupancy intermediate, labeled LMW, is clearly evident at the lowest molar ratio of 1:3, and persists at the same elution volume even at the highest molar ratios. Higher occupancy species, HMW, are also apparent at a ratio of 1:3 and become increasingly distinct as LC8 is increased. The peak corresponding to excess LC8 is discernable at a ratio of 1:7, and steadily increases as LC8 is added. Taken together, the data in Figure 4 are consistent with the explanation that a low occupancy form of the hLBD:LC8 complex is favored even with a large excess of LC8. A minor population of high occupancy complexes, present even at the lowest molar ratio, increases with increasing LC8 and is in equilibrium with the LMW species and with free LC8, and therefore with each other. Both Drosophila and human LBD exhibit this dynamic behavior, suggesting it is a conserved feature of the ASCIZ:LC8 interaction. In order to visualize the various oligomeric states of ASCIZ-LC8, we analyzed electron microscopy data of dLBD and hLBD under saturating concentrations of LC8. As a positive control, and for validation of EM conditions, similar experiments were carried out with complexes of Nucleoporin159 (Nup159), another intrinsically disordered protein with multiple LC8 binding sites (Stelter et al., 2007). Nup159:LC8 complexes were clearly visualized as a linear array of 5 stacked densities of LC8, as previously reported (Stelter et al., 2007) (data not shown), and consistent with the conclusions of Nup159:LC8 biophysical solution experiments (Nyarko et al., 2013). In contrast, despite the similar overall affinity (Nup159-LC8 Kd = 2.9 μM) (Nyarko et al., 2013), in negative stain images of dLBD:LC8 and hLBD:LC8 complexes, the vast majority of complex species appear dissociated on the grid (Figure 5a, arrow heads). However, a few observable complexes could be clearly resolved from raw micrographs, identified as linear stacks of punctate densities, akin of beads on a string (Figure 5a, squares), similar to images of Nup159 bound to LC8 (Stelter et al., 2007). Furthermore, although dLBD contains seven and hLBD 11 LC8 binding sites, the vast majority of complexes observed by EM appeared to be of low LC8 occupancy. dLBD:LC8 and hLBD:LC8 complexes visualized by negative stain electron microscopy. (a) Representative micrograph of negatively stained hLBD:LC8 complexes. Identified oligomeric complexes are boxed. Non-oligomeric LC8 dimers are indicated by arrowheads. Scale bar = 100 nm. dLBD:LC8 micrographs had the same appearance (not shown). (b) Representative 2D projection averages of (top) dLBD:LC8 oligomers and (bottom) hLBD:LC8 oligomers. Only low-occupancy oligomers with 2–4 LC8 dimers (2mer – 4mers) were successfully averaged. Higher-occupancy oligomers were identified in raw micrographs (Figure 5—figure supplement 1), but were not averaged due to low population and/or high degree of conformational flexibility. Scale bar = 20 nm. (c) Histogram showing the normalized population distribution of LC8 occupancy in complexes formed with dLBD (grey) and hLBD (black), identified from raw micrographs. 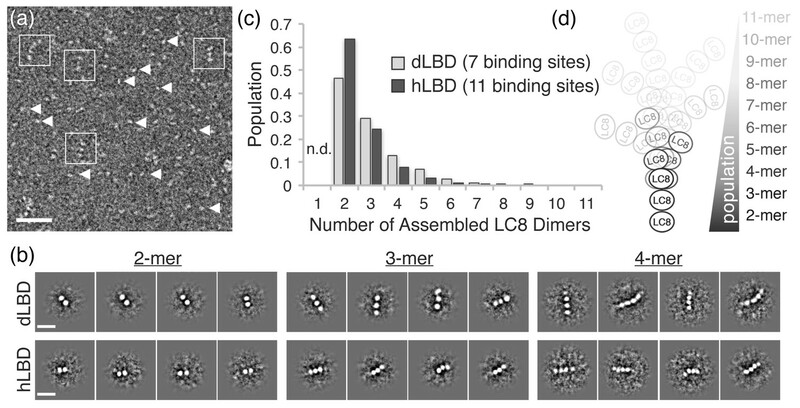 The population of complexes formed with a single LC8 dimer were not determined (n.d.) (d) Illustration representing the distribution of LC8 occupancy and conformational flexibility observed in hLBD:LC8 complexes. Reference-free two-dimensional (2D) classification routines were carried out on datasets of ~2000 single particle images of dLBD:LC8 complexes and ~1000 particles of hLBD:LC8 complexes extracted from ~300 and 200 micrographs, respectively. These produced 2D projection averages for dLBD:LC8 and hLBD:LC8 oligomers displaying complexes formed with 2–4 stacked densities, corresponding to LC8 dimers, deduced from the dimensions of the averaged bead-like densities (~4 nm diameter) (Benison et al., 2007; Stelter et al., 2007). Complexes with three or more LC8 dimers displayed significant conformational flexibility in 2D class averages (Figure 5b) and in the single-particle images (Figure 5a and Figure 5—figure supplement 1). The extent of conformational variability is consistent with ~10–20 Å spacing measured between LC8 densities, and the intrinsic flexibility of the IDP duplex chain separating the neighboring LC8 TQT recognition motifs. The formation of higher-order oligomers appeared relatively rare in comparison to the low occupancy complexes. The scarcity of higher order complexes, coupled with the intrinsic conformational heterogeneity, precluded our ability to obtain 2D class averages of the high-occupancy complexes. To overcome this limitation, statistical analysis describing the distribution of oligomeric states was obtained by hand-selection and classification from single-molecule images (Figure 5—figure supplement 1). Both dLBD:LC8 and hLBD:LC8 complexes form an ensemble of structures, displaying an exponential distribution with low-occupancy states (i.e. 2–4 stacked LC8 dimers) being most abundant (Figure 5c,d). Density corresponding to the IDP duplex chain cannot be resolved by negative stain EM, therefore complexes formed with a single LC8 dimer were not included in this analysis, as they could not be distinguished from unbound LC8 dimers. Together, this analysis shows dLBD and hLBD form dynamic assemblies with LC8 that favor low occupancy states (Figure 5d). Although uncommon, high-occupancy and fully-formed complexes of dLBD:LC8 (1:7 ratio) could be identified from the raw single particle images (Figure 5—figure supplement 1), further confirming the stoichiometry obtained by our ITC studies. For the hLBD:LC8 dataset, complexes containing as many as 7–9 LC8 dimers could be distinguished from the single particle image data, while higher-order complexes containing 10–11 LC8 dimers were either not distinguishable or were simply absent under the limiting concentrations required for negative stain EM specimen preparation. Nevertheless, the remarkable similarity in distribution of oligomeric species formed by dLBD and hLBD, obtained under similar binding conditions, is consistent with the nearly equivalent overall LC8 affinity determined by ITC, and suggests that a conserved mechanism of negative cooperativity is used by ASCIZ to regulate the formation and distribution of higher-order LC8 assemblies. If dLBD and LC8 form stable intermediate complexes with excess LC8, which of the seven recognition sites in Drosophila ASCIZ are preferentially bound? Notably, the linear assembly pattern of LC8 dimers observed by negative stain EM suggests an ordered (or quasi-ordered) sequence of assembly, apparently favoring neighboring TQT sites. However, the location of LC8 binding sites could not be resolved in these experiments. Therefore, to examine interactions between individual motifs and LC8 in the context of the full dLBD, we turned to NMR. As unlabeled LC8 is titrated into solutions of 15N-13C- labeled dLBD, changes in NH peak intensities can be measured in 3D HNCO spectra recorded for dLBD:LC8 molar ratios of 1:0.25, 1:1, 1:2, 1:5, 1:8. As LC8 concentration increases, a corresponding decrease in dLBD peak intensity is observed (Figure 6a). At a molar ratio of 1:5, less than 10% of the original peak intensity remains at all seven LC8 binding sites. At a ratio of 1:8, all dLBD peaks completely disappear except for peaks corresponding to eight N-terminal residues (241-248), indicating that all TQT sites have been occupied to some degree. The absence of peaks for bound dLBD is attributed to line broadening associated with intermediate exchange processes and/or faster transverse relaxation as a result of increased complex size. Therefore, we consider a decrease in peak intensity as a measure of increased complex formation. NMR titration of the dLBD with LC8. Relative intensities of non-proline NH peaks in 15N-13C-HNCO spectra are shown for (a) dLBD, (b) QT2-4, and (c) QT4-6 titrated with LC8 at molar ratios of 1:0.25, 1:1, 1:2, 1:5, and 1:8. Peak intensities (I) are given relative to the intensity of the same peak in free peptide (I0). Above (a) are 1D NMR slices of representative amino acids from TQT motifs QT1 (T261), QT3 (T294), QT4 (T332), QT7 (T382) and a control (S244). Representative slices of HNCO spectra from multiple titration points are shown in Figure 6—figure supplement 1. (d–g) The I/I0 data are alternatively plotted as the average intensity ratio for each 10-amino acid motif versus the molar ratio of dLBD:LC8. For the dLBD complex, titration curves of individual motifs cluster in two groups having higher (d) or lower (e) average intensity ratios at the same dLBD:LC8 molar ratio. Similarly, for the two shorter constructs, plots of average I/I0 for individual motifs cluster in two groups, motifs in QT2-4:LC8 having higher intensity ratios (f), and motifs in QT4-6:LC8 having lower intensity ratios (g). Motif designations in (d) and in (f) are: QT1 (triangle), QT2 (square), QT3 (diamond). Motif designations in (e) and (g) are: QT4 (triangles), QT5 (squares), QT6 (diamond), and QT7 (circle). Note that complete peak attenuation at any titration point is given a value of 0 (Figure 6g). In (d) values are shown for a negative control group (crosses, dotted line) comprised of those measurable at saturating LC8 concentration in the first eight amino acids, 241–249. In panels (d–g), solid curves are to guide the eye. Notably, peaks at the C-terminal half of the protein, QT4-7, decrease more quickly than peaks at the N-terminal half, implying that LC8 preferentially occupies these motifs. To confirm this observation and to obtain titration information for the missing residues in this region, we performed similar experiments on the smaller QT2-4 and QT4-6 constructs. QT2-4 was chosen to further validate LC8 binding to the QT3 motif that as an individual peptide showed weak binding by ITC, and QT4-6 was chosen because it has the highest LC8 binding affinity (Figure 3b). Further, the two constructs share the QT4 motif, allowing us to assess its affinity in two sequence contexts. Due to the smaller number of peaks for shorter constructs, HSQC spectra have a sufficiently high resolution to render an HNCO-based titration unnecessary. Unlabeled LC8 was titrated into 15N-labeled QT2-4 or QT4-6 and changes in peak intensity were analyzed (Figure 6b,c). As with dLBD, there is a gradual decrease in peak intensity as more LC8 is added to QT2-4 or to QT4-6 at molar ratios: 1:0.25, 1:1, 1:2, 1:3, and 1:4. Significantly, peak intensities in QT4-6 decrease at lower LC8 ratio than in QT2-4, confirming the trend we observe in full-length dLBD. In QT4-6, nearly all peaks in the motif region disappear at a ratio of 1:2, while ~30% of peak intensity remains in QT2-4. Furthermore, NMR titration of QT2-4 with LC8 confirms that QT3 is an LC8 binding motif. The peaks corresponding to QT3 decrease in intensity at the same rate as peaks corresponding to the QT2 and QT4 motifs. The peaks in the linker region (residues 305–320) decrease more slowly, indicating that they are not interacting with LC8, but merely experiencing the effects of a larger correlation time. Plots of the average peak intensity (I/I0) for each 10-amino acid motif in dLBD, and in each of QT2-4 and QT4-6 constructs clearly show the dichotomy in the pattern of peak attenuation (Figure 6d–g). In dLBD, the first three (Figure 6d) show a different titration pattern and weaker binding than the last four motifs (Figure 6e). This dichotomy is replicated in separate plots of the 3 QT motifs in each of the constructs QT2-4 and QT4-6; the average I/I0 of motifs in QT2-4 (Figure 6f) drops to 0.2 at LC8 molar ratio 1:2, twice that observed for motifs in QT4-6 (Figure 6g) which reach the same I/I0 at molar ratio 1:1. The apparently higher LC8 affinity of motifs 4–6 (Figure 6e,g), relative to motifs 2–4 (Figure 6d,f) is consistent with our ITC experiments (Figure 3a). The QT4 motif, common to both constructs, has a different rate of peak disappearance in each construct, suggesting that motif environment, not local sequence, determines its affinity. We conclude that the recognition motifs QT4-QT7 are the sites favored in stable low occupancy complexes. In summary, the data in Figure 6 showing peak attenuation across the whole sequence, even at low LC8 ratios, suggest population of an ensemble with all LC8 sites occupied to varying degree, but with clear preference for the C-terminal motifs. Preferential binding of the C-terminal motifs is additionally supported by ITC results, which show that LC8 binds to the QT4-6 construct with slightly higher affinity than the full-length dLBD (Figure 3a,b). NMR dynamics experiments also demonstrate that residues in the C-terminal motifs are slightly more ordered in comparison to the N-terminal motifs (Figure 2f–g, Figure 2—figure supplement 1a), which may explain the tighter LC8 binding to this region. To investigate how the number of bound LC8 molecules affects the transcriptional activity of ASCIZ, we turned our attention to the human protein whose transcriptional activity can be assayed in cell culture using an ASCIZ knockout mouse embryonic fibroblast cell line (Jurado et al., 2012a). Human ASCIZ has eleven LC8 recognition motifs that we have numbered 1 to 11 (Figure 7a). To prevent LC8 binding to specific ASCIZ motifs, TQT recognition motifs were mutated to AAA. Five human ASCIZ mutant constructs were generated: AAA1-4 with an AAA replacement at each TQT motifs 1–4, and similarly named mutant constructs of AAA8-11; AAA5-11; AAA1-4, 8–11; and AAA-all. The number of LC8 recognition motifs tunes ASCIZ transcriptional activity. (a) Domain structure of human ASCIZ, showing 11 LC8 binding motifs as blue bars. Additional non-TQT motifs are shown as gray bars. (b) Shown are representative isothermal titration plots of LC8 with the hLBD and constructs with four (AAA1-4 and AAA8-11), seven (AAA5-11), eight (AAA1-4, 8–11), or fourteen (AAA-all) mutant LC8 binding sites. Data were fit to a single site binding model using Origin software. (c) Firefly luciferase reporter assays of ASCIZ knockout mouse embryo fibroblast cells transiently transfected with WT human ASCIZ (blue), a zinc finger deletion construct (red), and ASCIZ mutant constructs AAA1-4, AAA8-11, AAA5-11, AAA1-4, 8–11, or AAA-all (shades of orange), along with the Dynll1 luciferase and Renilla luciferase vectors. The number of available motifs is indicated above each construct. Error bars are ±S.E. relative to Renilla luciferase as a control. Asterisks (*) indicate p values less than 0.01. Data is the average of 2–4 independent experiments. Although the differences in transcriptional activity between each construct is small, the overall trend indicates an increase in transcriptional activity with a decrease in available binding motifs. A western blot depicting expression of the ASCIZ constructs is shown in Figure 7—figure supplement 1. (d) Binding affinity of each construct for LC8 is plotted against luciferase activity. Data points are colored according to (c). The AAA-all construct is excluded from the graph because it does not bind to LC8. To confirm loss of LC8 binding in vitro for each TQT when replaced with AAA, identical mutations were made in ASCIZ hLBD constructs, named in the same fashion. To completely eliminate LC8 binding in the AAA-all construct, it was necessary to also mutate three SQT/VQT motifs in addition to the 11 TQT motifs identified in our ITC experiments and in pepscan experiments (Figure 7a, gray bars) (Rapali et al., 2011a). This suggests that human ASCIZ may contain additional binding motifs, as seen with the TMT motif in Drosophila ASCIZ. The effective affinity and stoichiometry of binding of LC8 to WT ASCIZ hLBD and each mutant hLBD was determined (Figure 7b, and Table 3). WT hLBD binds LC8 with an hLBD:LC8 ratio of 1:11 (two chains of ASCIZ to 11 LC8 dimers), and an overall Kd value of 0.9 μM (Table 3). The four hLBD mutants each binds LC8 with the expected stoichiometry for the number of intact LC8 recognition motifs and with overall affinities in the range of 0.7–4.4 μM. Thermodynamic parameters of ASCIZ-LC8 interactions. To assess the impact of these mutations on ASCIZ transcriptional activity, luciferase reporter assays were carried out using immortalized ASCIZ knockout mouse embryonic fibroblasts transiently transfected with the full-length WT or a mutant ASCIZ gene and a plasmid containing the LC8 promoter. The measured luciferase activity was normalized against Renilla luciferase (Figure 7c). Empty vector and the ΔZnF construct showed limited transcriptional activity compared to ASCIZ constructs. Most significantly, transcriptional activity of the AAA mutants can be ranked to form an activity gradient (Figure 7c) notable for a clear inverse relationship between their transcriptional activity and their affinity for LC8. While the differences between each construct are very small, the overall trend supports the hypothesis that affinity and transcriptional activity are correlated. The construct with the highest affinity for LC8 by ITC, AAA8-11, exhibits equal or slightly lower transcriptional activity than WT ASCIZ, while the construct with the lowest affinity for LC8, AAA1-4, 8–11, has 2.5x the activity of WT ASCIZ. The correlation between transcriptional activity and affinity for LC8 is also shown in Figure 7d. As the number of available binding sites decreases and Kd correspondingly increases, transcriptional activity also increases. One exception to this trend is the AAA-all construct with zero functional LC8 binding sites (AAA-all), which shows equal or somewhat lower activity than the construct with three intact sites (AAA1-4,8–11). As both the ZnF and LBDs of ASCIZ are monomeric in the absence of LC8, a plausible explanation for this effect could be that dimerization of ASCIZ by a minimal number of LC8 molecules is required for optimal binding to the DYNLL1 gene promoter, or the binding of dimeric transcription co-activators to ASCIZ. In summary, the data in Figure 7 indicate that, in general, ASCIZ transcriptional activity appears to vary inversely with the number of LC8 recognition motifs and with binding affinity, and that fine tuning within this trend depends on which motifs are occupied and their specific dissociation constants. A distinctive feature of ASCIZ is the high number of LC8 recognition motifs within its large, disordered C-terminal domain. Here we integrate multiple approaches to elucidate the structure, dynamics, thermodynamics, and hydrodynamics of the large disordered ASCIZ-LC8 complexes, that together reveal a new model by which ASCIZ can maintain stable pools of the hub protein LC8. We tested the main features of this model in cells using transcription activity assays which show a trend wherein mutant ASCIZ constructs with lower LC8 occupancy display higher transcriptional activity, while constructs with higher LC8 occupancy have lower activity. 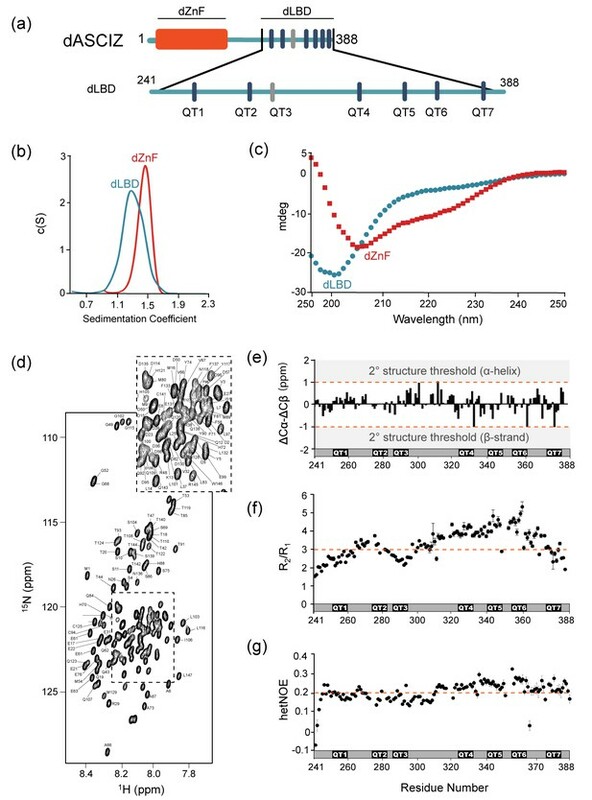 We propose that a dynamic ensemble of complexes is important for fine-tuning ASCIZ transcriptional activity, where stable, low occupancy complexes function to maintain a basal buffering transcription rate for LC8. A change in LC8 cellular concentration would shift this dynamic equilibrium to a higher or lower occupancy state without dramatically altering the level of transcription. As LC8 is an essential regulator of dozens of cellular processes, an ability to maintain an LC8 ‘buffer’ is likely important for cellular homeostasis. Although many other transcription factors are regulated by multisite phosphorylation (Holmberg et al., 2002) or multiple binding events to different proteins (Cantor and Orkin, 2002; Reményi et al., 2004), we find no examples of activity tuned by multivalent binding to the gene product in a negative autoregulatory role, which underscores the novelty and potential impact of this study. ASCIZ has three structural and functional features that together set it apart from other multivalent transcription factors. (1) ASCIZ has an exceptionally long intrinsically disordered C-terminal domain compared to other intrinsically disordered transcription factors. Human ASCIZ contains an intrinsically disordered domain that is 600 amino acids long, or 73% of its overall sequence. The well-studied transcription factor p53, by contrast, is 40% disordered and the disordered regions are dispersed through three different regions of the protein rather than being concentrated on one terminus (Laptenko et al., 2016). Intrinsically disordered regions longer than 50 amino acids are considered to be of significant size for eukaryotic transcription factors (Liu et al., 2006). As intrinsic disorder is proposed to play an important role in regulating function (Shammas, 2017), it is possible that the length of the disordered domain enables a larger diversity of functions. Indeed, recent work has shown that the length of the intrinsically disordered domain can control transcriptional activity through ‘energetic frustration’, wherein opposing energetic couplings mediate the overall activity (Li et al., 2017). (2) ASCIZ interactions with LC8 display both positive and negative cooperativity that together create a dynamic equilibrium of stable, low occupancy ASCIZ-LC8 complexes. ASCIZ binding to LC8 forms an IDP duplex scaffold (Clark et al., 2015) onto which other copies of LC8 or other dimeric partners can bind with higher affinity. The first two to four recognition motifs bind to LC8 with positive cooperativity, as evidenced by ITC experiments that show an enhancement in binding affinity from the presence of neighboring motifs (Figure 3, Table 1). Negative cooperativity regulates the formation and distribution of higher-order LC8 assemblies, as shown by the dominance of low occupancy complexes at saturating concentrations of LC8 (Figures 4 and 5). Negative cooperativity observed between low occupancy complexes and the fully occupied complex suggests that when the concentration of LC8 exceeds the buffering capacity of the low occupancy intermediates, the fully occupied complex is formed to switch off transcription. A distribution of low occupancy dynamic complexes is a conserved feature of the ASCIZ:LC8 interaction. Evidence for a dynamic ASCIZ:LC8 ensemble comes from a combination of AUC, gel filtration, native gel electrophoresis, and negative stain electron microscopy data (Figures 4–5, Figure 4—figure supplement 1). For both Drosophila and human LBD constructs, addition of excess LC8 results in formation of stable low molecular weight (LMW) complexes and a minor population of high molecular weight complexes (Figures 4 and 5). Negative stain electron microscopy experiments show an exponential distribution of complexes, with assemblies containing 2–4 stacked copies of LC8 clearly visualized in 2D projection averages and suggesting a high degree of flexibility within the duplex IDP linkers persists upon complex formation (Figure 5). Multivalency and intrinsic disorder in ASCIZ’s LC8 binding domain enable this dynamic ensemble of low occupancy complexes. Many proteins utilize multiple binding sites within intrinsically disordered regions for regulation, complex formation, and a multitude of other functions (Cortese et al., 2008; Uversky, 2015). In some examples, multiple binding sites serve as a scaffold to bring proteins together (Cortese et al., 2008), while in others, they modulate phase transitions that lead to the formation of bimolecular condensates (Banani et al., 2017; Banani et al., 2016). The diversity of these examples highlights the importance of multivalency and intrinsically disordered regions in protein function and regulation. It is of note that although ASCIZ’s multiple binding sites are similar to those that lead to phase transitions in other systems (Li et al., 2012), we did not detect this behavior in vitro. However, ASCIZ puncta formation has been observed in cell culture in response to treatment with MMS, a DNA methylation agent (Jurado et al., 2012a; Jurado et al., 2010), (McNees et al., 2005). These puncta do not form in the absence of LC8, indicating that LC8 binding to multiple recognition motifs is necessary for foci formation. Comparison of ASCIZ with another LC8 multivalent binding partner, Nup159, underscores the uniqueness of the ASCIZ-LC8 assembly. While three other multivalent LC8 binding partners with more than two recognition motifs are known to exist (Dunsch et al., 2012; Fejtova et al., 2009; Gupta et al., 2012; Stelter et al., 2007), the role of multiple sites has only been characterized for ASCIZ (this work) and Nup159 (Nyarko et al., 2013). Nup159 cooperatively binds five LC8 dimers and forms a relatively stable complex readily visible by electron microscopy and 2D classification analysis (Stelter et al., 2007). As Nup159 has a slightly lower affinity for LC8 than ASCIZ (2.9 μM vs. 0.9 μM, respectively (Nyarko et al., 2013), the difference between the Nup159 grids with uniformly stacked structures and the ASCIZ grids with sparse and heterogeneous structures of 2–4 stacked LC8 dimers is intriguing. This difference in structural heterogeneity can be attributed to the higher flexibility or short life time of ASCIZ:LC8 complexes relative to Nup159:LC8 complexes, while the scarcity of high-occupancy states is consistent with a unique mode of negative cooperativity. Given the different function of Nup159 (in nuclear pore assembly) versus ASCIZ:LC8 complexes (transcription regulation), the data suggest that the dynamic properties and unique mechanism of assembly that is conserved in LC8-ASCIZ complexes may reflect an important feature required for autoregulation of LC8 transcription. (3) ASCIZ regulates its transcriptional activity by binding multiple copies of its gene product, LC8. Cell culture based transcription assays demonstrate that ASCIZ affinity for LC8 is negatively correlated with transcriptional activity (Figure 7). Although the differences between each construct are very small, we see an obvious trend where fewer occupied LC8 binding motifs lead to increased ASCIZ transcriptional activity, and vice versa. The results of this assay suggest that LC8 concentration could fine-tune ASCIZ activity in a cellular environment by shifting the population of complexes towards higher or lower occupancy states. A great example of multisite regulation is the E26 transformation-specific transcription factor (Ets-1), which tunes its transcriptional activity through multisite phosphorylation of its serine-rich domain. Phosphorylation of the serine rich region occludes the DNA-binding interface and stabilizes its helical inhibitory module, inhibiting Ets-1 DNA binding ~20 fold (Desjardins et al., 2014; Lee et al., 2008; Pufall et al., 2005). Similarly, the function of p53 is modulated by over 50 posttranslational modifications that are proposed to be interdependent (Meek and Anderson, 2009). Phosphorylation of specific p53 residues prevents binding to the inhibitory protein HDM2, while increasing binding to the activating proteins CREB-binding protein (CBP) and p300 (Ferreon et al., 2009). p53 affinity for CBP/p300 depends on the extent of p53 phosphorylation; successive phosphorylation events increase p53 affinity for the TAZ1, TAZ2, and KIX domains of CBP/p300 (Lee et al., 2010; Teufel et al., 2009). p53 also binds to a multitude of other proteins that regulate its activity (Beckerman and Prives, 2010). While many other transcription factors tune their activity through multisite regulation, we could find no other examples besides ASCIZ where binding to multiple copies of their gene product modulates activity; yet, the prevalence of IDP domains in transcription factors indicates that such mechanisms are likely to be widespread and studies such as these are becoming more tractable with the integrated approaches used here. Based on our experimental data, we have developed a model of ASCIZ transcriptional regulation that illustrates the relationship between transcriptional activity (red arrow) and LC8 concentration (blue arrow) (Figure 8). As the cellular level of LC8 (blue dimers) increases, the number of LC8 molecules bound to ASCIZ also increases. The ASCIZ-LC8 complex primarily exists as a dynamic equilibrium of different complex stoichiometries and degrees of disorder (center brackets). 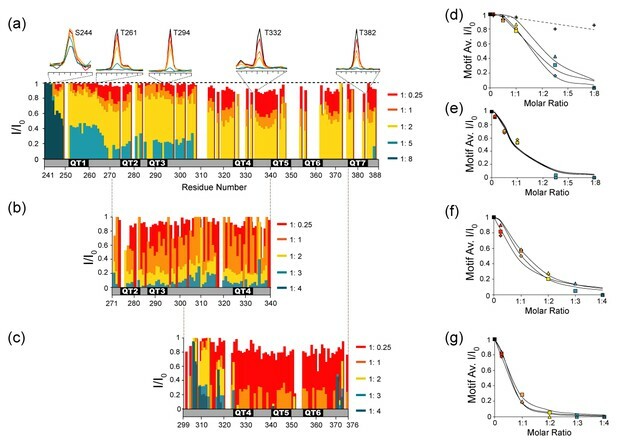 We propose that this low occupancy conformational ensemble is important for maintaining a basal level of LC8 transcription. It acts as a buffer for changes in the concentration of LC8 and fine-tunes transcription levels according to cellular needs. 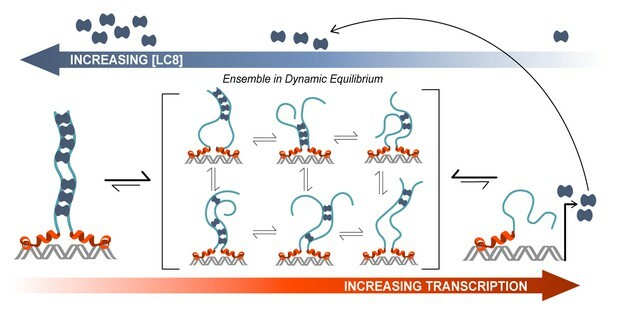 A change in LC8 cellular concentration would shift this dynamic equilibrium to a higher or lower occupancy state without dramatically altering the level of transcription. All 11 (or 7) binding sites are therefore occupied in the heterogeneous mixture of complexes, as is demonstrated by NMR titration (Figure 6), and participate in maintaining a homeostatic concentration of LC8. Thus, it is ensured that a high concentration of LC8 does not drastically decrease LC8 production, but rather shifts it to a lower level. As LC8 is a hub protein that interacts with >40 protein partners, and is predicted to bind to 100 additional proteins from a diverse selection of cellular pathways (Rapali et al., 2011b), maintaining a constant level of its transcription is essential. Model of ASCIZ regulation of LC8 transcription. A proposed model of LC8 transcriptional regulation is shown for dASCIZ, which also applies to the human protein. Free LC8 dimers (dark blue) bind to ASCIZ and modulate transcriptional activity. Transcriptional activity is lowest when ASCIZ recognition motifs are fully occupied by LC8 (left) and is highest when ASCIZ is bound to a small number of LC8 dimers or not bound to LC8 (right). A dynamic, low-occupancy complexes (center) are composed of ASCIZ bound to 2–4 LC8 dimers. LC8 that is produced upon ASCIZ transcription returns to the pool of free LC8. Studies were carried out using constructs from human ASCIZ (Uniprot O43313) as well as Drosophila ASCIZ (dASCIZ) (Uniprot Q9VZU1) which, with its fewer recognition motifs, smaller size, and available mutant phenotypes, is a tractable model of the human ASCIZ. Constructs of the dASCIZ zinc finger domain (ZnF) and the LC8 binding domain (dLBD) were generated by cloning residues 1–156 or 241–388, respectively, of Drosophila ASCIZ into the pET2Zt2-1a vector. The constructs were expressed in frame with a hexahistidine tag, Protein A solubility tag, and cleavage site for the tobacco etch virus (TEV) enzyme. Shorter constructs of the dLBD were generated by cloning residues 241–324 (QT1-3), 271–341 (QT2-4), 299–376 (QT4-6), and 321–388 (QT4-7) into the pET2Zt2-1a vector. The human LC8 binding domain (hLBD) construct was generated by cloning human ASCIZ (Uniprot O43313) residues 362–823 into the pET24d vector (Novagen) and expressing the construct in frame with a hexahistidine tag and TEV cleavage site. For the five human ASCIZ mutants, ASCIZ AAA1-4, AAA8-11, AAA5-11, AAA1-4,8–11, and AAA-all, residues 7–9 of the LC8 binding motif (usually the residues TQT), were mutated to AAA to prevent binding. Mutations were performed using either the QuikChange Lightening Mutagenesis Kit (Agilent) or by synthesizing short constructs (300–350 bp) containing the desired mutations and using Gibson Assembly (New England Biosciences, Ipswich) to insert them into the LC8-binding domain (hLBD) gene (residues 362–823 of human ASCIZ). All constructs were transformed into Escherichia coli Rosetta DE3 cells and expressed at 37°C in LB or minimal autoinduction media with 12C or 13C glycerol and 15NH4Cl as the sole carbon and nitrogen sources, respectively. Recombinant protein expression was induced with 0.4 mM IPTG (for LB cultures) and growth continued at 25°C for 16 hr. Cells were harvested and purified under denaturing conditions using TALON His-Tag Purification protocol (Clontech). The solubility tag and/or hexahistidine tag were cleaved by TEV protease and the protein was further purified using strong anion exchange chromatography (Bio-Rad, Hercules, California) followed by gel filtration on a SuperdexTM 75 gel filtration column (GE Health). The purity of the recombinant proteins, as assessed by SDS-polyacrylamide gels, was >95%. The pure proteins were stored at 4°C and used within 1 week. LC8 was prepared as previously described (Barbar et al., 2001). Peptides corresponding to the seven putative recognition sequences from dASCIZ were commercially synthesized: YMSSQKLDMETQTEE (QT1p), YLAPLLRDIETQTPD (QT2p), YTPDTRGDIGTMTDD (QT3p), DLQTSAHMYTQTCD (QT4p), EELGLSHIQTQTHW (QT5p), WPDGLYNTQHTQTCD (QT6p), and EPDNFQSTCTQTRW (QT7p) (GenScript, Piscataway, NJ). Non-native amino acids (underlined in Table 2) were added to the N-terminus to enhance solubility or concentration determination by UV absorbance at 280 nm. Binding thermodynamics of the ASCIZ and dASCIZ construct/peptide-LC8 interactions were obtained at 25°C with a VP-ITC microcalorimeter (Microcal, Westborough, MA). The binding buffer was composed of 50 mM sodium phosphate, 50 mM sodium chloride, 1 mM sodium azide, 5 mM β-mercaptoethanol, pH 7.5. Protein concentrations were determined by absorbance measurement at 280 nm. Extinction coefficients for each construct are as follows. LC8 = 14,565 M−1cm−1, dLBD = 17,085 M−1cm−1, LBD = 15,470 M−1cm−1, QT1−3 = 2,980 M−1cm−1, QT2−4 = 2,980 M−1cm−1, QT4−6 = 10,095 M−1cm−1, QT4−7 = 14,105 M−1cm−1. dLBD was placed in the reaction cell at a concentration of 8 μM and titrated with LC8 at a concentration of 800 μM. For binding of dASCIZ constructs QT1-3, QT2-4, QT4-6, and QT4-7, 10 μM of construct was titrated with 400 μM LC8. For interactions with synthetic peptide, peptides were dissolved in binding buffer to a final concentration of 300 μM and then added to LC8 at a concentration of 30 μM in the reaction cell. ASCIZ hLBD and mutant hLBD constructs were placed in the reaction cell at a concentration of 9–16 μM and titrated with 900 μM LC8. Peak areas were integrated and data were fit to a single-site binding model in Origin 7.0 from which the stoichiometry (N), dissociation constant (Kd), and the change in enthalpy (ΔH), and entropy (ΔS) were obtained. Reported data are the average of two or more independent experiments. As the binding-model fit was very good and data were reproducible, error was determined based on a 5% uncertainty in protein concentration calculations. CD experiments were conducted on a Jasco720 spectropolarimeter in a 1 mm cell. For the spectrum of dLBD and smaller constructs, ten scans were averaged at a concentration of 30 μM in a buffer composed of 10 mM sodium phosphate, pH 7.5, at 25°C and 10°C. For the ZnF, ten scans were averaged at a concentration of 25 μM in a buffer composed of 10 mM sodium phosphate, 200 mM sodium sulfate, 50 μM zinc sulfate, pH 7.5, at 10°C, 25°C, and 35°C. Sedimentation velocity experiments for the titration of dLBD and LC8 were performed in a Beckman Coulter Model XL-I analytical ultracentrifuge equipped with UV/Vis scanning optics. Reference (400 μL binding buffer; 50 mM sodium phosphate, 50 mM sodium chloride, 1 mM sodium azide, 5 mM TCEP, pH 7.5) and sample (380 μL) solutions were loaded into 12 mm double-sector cells with quartz windows and the cells were then mounted in an An-50 Ti 8-hole rotor. LC8 was prepared at a concentration of 15 µM while the concentration of dLBD was varied from 15 to 1.5 µM. Proteins were centrifuged at 50,000 rpm at 20°C, and radial absorbance data were collected at appropriate wavelengths in continuous mode every 5 min without averaging. Data were fit to a continuous size-distribution [c(S)] model using the program SEDFIT (Schuck, 2000). The partial specific volume of the proteins, buffer density, and buffer viscosity were computed using the program SEDNTERP (Hayes and Philo, 1995). Sedimentation velocity experiments for the ZnF domain were performed on a Beckman ProteomeLab XL-A/XL-I analytical ultracentrifuge in a buffer composed of 50 mM sodium phosphate, 200 mM sodium chloride, 0.4 mM zinc sulfate, 1 mM sodium azide, 2 mM TCEP, pH 7.0. The sample was centrifuged at 40,000 rpm at 20°C for 7 hr and absorbance data were collected at 286 nm. Data were fit to a continuous size-distribution [c(s)] model using the program SEDPHAT (Vistica et al., 2004). NMR measurements were collected at 10°C, using 300–350 μM isotopically (13C/15N or 15N) labeled dLBD in a buffer at pH 6.5 composed of 10 mM sodium phosphate, 10 mM sodium chloride, 1 mM sodium azide, 10 mM β-mercaptoethanol, a protease inhibitor mixture (Roche Applied Science, Madison, WI), and 2–2 dimethylsilapentane-5-sulfonic acid for 1H chemical shifts referencing. Data for backbone assignments were collected on a Bruker Avance 850 MHz spectrometer equipped with a cryoprobe. Five-dimensional HN(CA)CONH and HabCabCONH experiments (Kazimierczuk et al., 2010; Motáčková et al., 2010; Nováček et al., 2011) and a three-dimensional HNCO experiment were acquired with non-uniform sampling of the indirectly detected dimensions and used for sequential assignment of 13C-15N- dLBD. Interaction of unlabeled LC8 and 13C-15N labeled dLBD was characterized by collecting three-dimensional BEST-TROSY-HNCO spectra at multiple molar ratios of LC8, 1: 0.25 (dLBD: LC8), 1:1, 1:2, 1:5, and 1:8. For the interaction of unlabeled LC8 with 15N-labeled QT2-4 (residues 271–341) or QT4-6 (residues 321–376), two-dimensional BEST-TROSY-HSQC spectra were collected at the molar ratios (QT2-4/QT4-6:LC8) 1:0.25, 1:1, 1:2, 1:3, and 1:4. NMR titration data were analyzed and plotted by measuring peak volumes using Sparky and averaging over each 10 amino acid QT motif. HNCO-based R1 relaxation measurements experiments were recorded with relaxation delay times ranging from 11.2 to 2352 ms, and the R2 relaxation data were acquired using relaxation delays ranging from 14.4 to 259 ms. Sixteen total R1 or R2 experiments were recorded, including six duplicate experiments for error determination. Curve fitting was performed using the rate analysis script Sparky2Rate and the program Curvefit (A. G. Palmer, Columbia University). Steady-state 1H−15N heteronuclear NOEs were acquired using 6 s total saturation time. Error bars were determined from the intensities of the baseline noise using the formula σ/(NOE) = [(σIsat/Isat)2 + (σIunsat/Iunsat)2]1/2, where Isat and σIsat correspond to the intensity of the peak and its baseline noise. All two-dimensional spectra and the three-dimensional HNCO spectra were processed using TopSpin (Bruker Biosciences; RRID:SCR_014227), and the non- uniformly sampled five-dimensional HN(CA)CONH and HabCabCONH spectra were processed with Sparse Multidimensional Fourier Transform (Kazimierczuk et al., 2009; Stanek and Koźmiński, 2010), (the software for data processing is available online at the Warsaw University Laboratory (nmr.cent3.uw.edu.pl/software)). All spectra were analyzed with the graphical NMR assignment and integration software NMRFAM-Sparky (RRID:SCR_014228). hLBD at a concentration of 30 μM was incubated with 600 μM LC8 at various molar ratios: (hLBD:LC8) 1:3, 1:5, 1:7, 1:9, 1:11, and 1:13. The complex was loaded on a Superdex 200 analytical column (GE healthcare, Wauwatosa, WI) in binding buffer: 50 mM sodium phosphate, 50 mM NaCl, 5 mM β-mercaptoethanol, 1 mM sodium azide, pH 7.5. 100 or 200 μl of protein samples were injected at a flow rate of 0.5 ml/min at room temperature and samples were monitored by UV absorption at 280 nm. For native gel electrophoresis titrations, dLBD or hLBD and LC8 were incubated at the molar ratios listed above and run on a 10% polyacrylamide gel at a constant 10 mAmps for 5–7 hr. Small-angle X-ray scattering experiments were conducted at the ESRF BioSAXS beamline BM29 (Pernot et al., 2013) in Grenoble, France. dLBD and LC8 samples were purified as described above and dialyzed into binding buffer (50 mM sodium phosphate, 50 mM sodium chloride, 10 mM beta-mercaptoethanol, 1 mM sodium azide, pH 7.5) before SAXS measurements. 30 μl of dLBD:LC8 complex (1:8 molar ratio) at five different concentrations for each sample (and buffer) were exposed to X-rays and scattering data collected using the robotic sample handling available at the beamline. 10 individual frames were collected for every exposure, each 2 s in duration using the Pilatus 1M detector (Dectris, Switzerland). Individual frames were processed automatically and independently within the EDNA framework, yielding individual radially averaged curves of normalized intensity versus scattering angle s = 4πSinθ/λ. Additional data reduction within EDNA utilizes the automatic data processing tools of EMBL-Hamburg ATSAS package (M. V. K. Petoukhov, P. V.; Kikhney A. G.; Svergun D. I., 2007), to combine timeframes, excluding any data points affected by aggregation induced by radiation damage, yielding the average scattering curve for each exposure series. Matched buffer measurements taken before and after every sample were averaged and used for background subtraction. Merging of separate concentrations and further analysis steps were performed manually using the tools of the ATSAS package (M. V. K. Petoukhov, P. V.; Kikhney A. G.; Svergun D. I., 2007) (RRID:SCR_015648). The forward scattering I(0) radius of gyration, Rg were calculated from the Guinier approximation (A., 1938), the hydrated particle volume was computed using the Porod invariant (Porod, 1982) and the maximum particle size Dmax, was determined from the pair distribution function computed by GNOM (Svergun, 1992) using PRIMUS. Electron microscopy (EM) studies were conducted using dLBD and hLBD incubated with a molar excess of LC8, and the formed complexes were negatively stained for contrast enhancement using established protocols (Myers et al., 2017). Briefly, dLBD (50 nM) was mixed with LC8 at a molar ratio 1:8, and human hLBD peptide (50 nm) was mixed with LC8 at a molar ratio of 1:13, in EM buffer containing 20 mM Tris, pH 7.5, 50 mM NaCl, 10 mM BME and 1 mM NaN3. A 3 μl drop of sample was applied to a glow-discharged continuous carbon coated EM specimen grid (400 mesh Cu grid, Ted Pella, Redding, CA). Excess protein was removed by blotting with filter paper and washing the grid two times with EM buffer. The specimen was then stained with freshly prepared 0.75% (wt vol−1) uranyl formate (SPI-Chem, West Chester, PA). Negatively stained specimens were visualized on a 120 kV TEM (iCorr, FEI, Hillsboro, OR) at a nominal magnification of 49,000x at the specimen level. Digital micrographs were recorded on a 2K × 2K CCD camera (FEI Eagle) with a calibrated pixel size of 4.37 Å pixel−1 and a defocus of 2.0–3.5 μm. For the dLBD-LC8 specimen, a total of 2574 single particle images were extracted from ~300 micrographs, and for hLBD-LC8, 1234 particles were extracted from ~200 micrographs. Complexes with clear oligomeric structure could be identified and were manually-selected using EMAN2 (Tang et al., 2007). Single particle images were extracted with a box size of 160 × 160 pixels and CTF-corrected (phase-flipped) in EMAN2. Reference-free 2D class averages were generated in EMAN2 and RELION 2.0 (Scheres, 2012) using CTF-corrected and high-pass filtered image datasets. Statistical analysis of oligomeric composition was performed by counting the number of subunits identified from single particle images and classifying them manually as 2 – 7mers (dLBD:LC8 complexes) or 2 – 11mers (hLBD:LC8 complexes) (Figure 5—figure supplement 1). Particles that could not be confidently assigned were discarded, leaving 2334 oligomers assigned for the dLBD:LC8 and 967 for hLBD:LC8 datasets. Complexes containing only a single LC8 dimer could not be distinguished from unbound LC8 particles, and were not included in our analysis. As a positive control, Nucleoporin159 (Nup159) in complex with LC8 was also prepared for negative stain EM under similar conditions to the dLBD/hLBD samples, and as previously described (Stelter et al., 2007) (not shown). As a negative control, we prepared EM grids with LC8 alone and dLBD/hLBD alone. No oligomeric structures (i.e. beads on a string) were observed in these images (not shown). To measure transcriptional activity of ASCIZ mutants, six ASCIZ constructs were cloned into the pEGFP vector (Clontech): WT ASCIZ (1-823), ΔZnF (230-823), ASCIZ AAA1-4, ASCIZ AAA8-11, ASCIZ AAA5-11, and ASCIZ AAA1-4, 8–11. Approximately 2 kbp of the Dynll1 promoter was cloned into the pGL3 vector (Promega, Madison, WI) upstream of the firefly luciferase gene as previously described (Jurado et al., 2012a). Using FuGENE 6 (Promega), immortalized ASCIZ knockout mouse embryonic fibroblasts (MEFs) (Jurado et al., 2010) were co-transfected with ASCIZ constructs, the Dynll1 promoter, and a pRL-CMV vector containing Renilla luciferase for normalization of firefly/luciferase ratios. The authenticity of the ASCIZ knockout MEF cell line was verified by PCR genotyping of the ASCIZ locus. The cell line tested to be free from mycoplasma contamination using a MycoAlert mycoplasma detection kit (Lonza, Switzerland). 24 hr after transfection, cells were transferred to 96-well plates and incubated overnight before determining reporter gene activities using the dual-luciferase reporter assay kit (Promega) and a Polarstar Optima (BMG Labtechnologies, Germany) instrument. For assessment of protein expression levels, human U2OS cells were transfected with ASCIZ constructs using FuGENE six and were probed with ASCIZ antibody (McNees et al., 2005). The chemical shifts for dLBD ASCIZ have been deposited in the Biological Magnetic Resonance Data Bank under accession code 27412. Computational and Structural Biotechnology Journal 9:e201402003. Cold Spring Harbor Perspectives in Biology 2:a000935. Journal of Molecular Biology 371:457–468. Progress in Biophysics and Molecular Biology 98:85–106. Journal of Molecular Biology 429:2975–2995. The Journal of Cell Biology 198:1039–1054. Journal of Biological Chemistry 291:6714–6722. The Journal of Cell Biology 185:341–355. Comptes Rendus Hebdomadaires Des Seances De L Acad Des Sci 206:1374–1376. The Journal of Cell Biology 198:115–126. Journal of Biological Chemistry 284:33115–33121. Trends in Biochemical Sciences 27:619–627. Journal of Biological Chemistry 287:3156–3164. The Journal of Experimental Medicine 209:1629–1639. Journal of Magnetic Resonance 197:219–228. Journal of Magnetic Resonance 205:286–292. Trends in Biochemical Sciences 41:1022–1034. Journal of Molecular Biology 382:1014–1030. Cold Spring Harbor Perspectives in Biology 1:a000950. Journal of Molecular Biology 359:1137–1149. Journal of Biomolecular NMR 48:169–177. Journal of Biomolecular NMR 50:1–11. Journal of Biological Chemistry 288:2614–2622. In: K. O Glatter O, editors. Small Angel X-Ray Scattering. London: Academic Press. pp. 17–51. Biochemical and Biophysical Research Communications 414:493–498. Nature Structural & Molecular Biology 11:812–815. Current Opinion in Structural Biology 42:155–161. Journal of Biomolecular NMR 47:65–77. Journal of the American Chemical Society 132:18000–18003. Thank you for submitting your work entitled "Multivalency in Transcriptional Regulation of the Hub Protein LC8" for consideration by eLife. Your article has been evaluated by a Senior Editor and three reviewers, one of whom is a member of our Board of Reviewing Editors. The reviewers have opted to remain anonymous. "Multivalency in Transcriptional Regulation of the Hub Protein LC8" describes a biophysical study that focuses on the mechanism of transcriptional control of the dynein light chain (LC8) through binding interactions with the disordered region of the transcription factor ASCIZ. All three reviewers felt that this is a fascinating system and that the work does help in understanding of how regulation does occur. Yet there were some reservations about the novelty, with significantly more experiments required at the in-vitro and cellular level to prove the hypothesis regarding the feedback mechanism regulating expression. In addition, it was felt that the work would be strengthened by additional NMR experiments to more fully characterize the binding. Thus, although all reviewers felt that the work was of interest, all noted weaknesses that prohibit publication in eLife. This work describes an elegant biophysical study that helps elucidate the mechanism of transcriptional control of the LC8 protein that is implicated in a wide range of biological processes. The authors come up with a mechanism whereby the disordered domain of the transcription factor ASCIZ is able to bind multiple copies of LC8, in effect, sensing its concentration and controlling levels of transcription of the LC8 gene through a competition with activator binding. Overall this is an exciting development, but I do believe that the work could be clarified by consideration of a number of points below. 1) The authors show by NMR that as a function of titration signal is lost due to exchange and increase in molecular weight. The major insight by NMR is that there are two different classes of binding regions that bind either 3 or 4 LC8 dimers with different affinities. Yet little mechanism into binding order to sites within these classes is obtained and as the authors mention the affinities are very different from ITC. Can the authors look at say smaller constructs that contain only 3 or only the 4 dimer sites in an effort to circumvent the issue with disappearing peaks? Indeed even smaller constructs would allow to address whether at low stoichiometries there is preferential binding to one of the sites, whether there is exchange between sites and what both the kinetics and thermodynamics might be. 2) Related to 1, I find it interesting and surprising that upon saturating binding there is a 1:3 complex that appears to be dominant (can the authors give the relative amounts of 1:3 vs. 1:7). I don't understand why the 1:3 can’t be saturated (pushed to fully bound) – simply thermodynamics would dictate this unless there is some sort of structural change. What is the mechanism involved here? And what are the implications for transcription, since even at very high concentrations of LC8 it appears that there will be some activation, which seems wasteful. The authors need to discuss this point more fully in terms of what the biological ramifications are/mean. 3) Related to 2 can the authors rationalize some of their transcription results where removing a number of ASCIZ sites seems not to matter? 4) In the proposed model there is a duplex of dLBD that is formed that aids in LC8 binding. Perhaps I am missing something, but the duplex evidence comes from the centrifugation results (or are there additional data?). How conclusive is the centrifuge results and if these are the primary data then please expand the Discussion. 5) More discussion should be given to other transcription systems. There is beautiful NMR work by McIntosh on ETS that shows a gradual change in activity with phosphorylation that is not discussed. It should be. The manuscript by Clark, et al., reports data on the binding of dynein light chain (LC8) to the disordered C-terminal region (CTR) of the zinc finger transcription factor ASCIZ. Others have reported that ASCIZ regulates the expression of LC8 in certain cell types, and in some cancer cell lines, and that disruption of this regulatory circuit is associated with mitotic defects seen previously with loss of LC8. In addition, others have reported that the CTR of ASCIZ contains multiple short linear motifs (SLIMs) with the sequence TQT known to bind to LC8. Here, the authors characterized seven LC8 binding SLIMs within the CTR of Drosophila ASCIZ using ITC, AUC, and NMR. As LC8 was titrated into the ASCIZ CTR, a mixture of sub-stoichiometric and 1:7 complexes were formed, presumably with two CTRs stitched together by multiple LC8 dimers (as proposed by the authors). Mutagenesis of several different combinations of multiple SLIMs confirmed their LC8 binding properties and allowed the rank order of their μM affinities to be determined. The authors noted that the affinity of the CTR, with multiple binding sites, for LC8 was higher than that of isolated binding site, but this point was not rigorously addressed in the manuscript. The authors extended their studies to the CTR of human ASCIZ, which they showed contains 11 LC8 binding SLIMs using ITC and mutagenesis. Finally, the authors performed a Luc-reporter transcription assay using wt and mutant ASCIZ expressed in ASCIZ null MEFs, which showed that mutation of LC8 binding SLIMs was associated with a slight increase in expression of the luc reporter. This latter finding suggests that LC8 exerts negative feedback on its expression by binding to the SLIMs within the CTR of ASCIZ, possibly altering DNA binding and/or interactions with other transcription factors. While the authors' hypothesis regarding this negative feedback mechanism is novel and interesting, the data in the manuscript fall well short of proving the hypothesis. Much more extensive in vitro and in cell data would be needed to establish the LC8 concentration dependence of the negative feedback circuit and further data required to elucidate the associated mechanism of feedback. In addition, the new knowledge gained regarding the identification of LC8 binding SLIMs within fly and human ASCIZ seems incremental with respect to the 2011 BBRC report from Rapali, et al. Therefore, the manuscript does not provide the level of rigor, novelty and impact associated with eLife but rather would be more suitable for a more technical journal. This manuscript describes the characterization of the disordered C-terminal region (LBD) of the transcription factor ASCIZ and its interaction via multiple short linear motifs to LC8. The binding regulates ASCIZ activity and provides a feedback loop for controlling transcription of LC8. Different biophysical tools are used to study the dynamic complex between the ASCIZ LBD and LC8, including ITC, analytical ultracentrifugation and NMR on primarily dASCIZ constructs but also including some human. Results clearly support a model with a dynamic (based on NMR) mixture of complexes with different LC8 occupancies (based on centrifugation) and with ASCIZ engaging LC8 at multiple different motifs. Arguments are made for the cooperativity of multivalent binding (based on ITC) and for the ability of this dynamic mixture of states enabling tunable transcription levels (based on transcription assays). Overall the manuscript describes extensive work on a fascinating system that offers insights into a mechanism for tunable regulation of transcription factor activity. The technical work appears to have been performed at a high level. The results are important for demonstrating a powerful example of the regulatory effects of multivalent binding of motifs within intrinsically disordered protein regions, one that could be more general. However, the authors do not place this example within the context of other literature on dynamic complexes involving multiple motifs of disordered proteins or other mechanistic approaches for generating tunable activity in transcription factors. 1) The authors should acknowledge this as an example of a dynamic or fuzzy complex and cite reviews (M Fuxreiter or others). The novelty of this being a unique case of multisite recognition is somewhat overstated. The manuscript should cite examples of other proteins that interact with multiple motifs and compare mechanistic effects of multi-site recognition with this mechanism. For two sites, this could include the p53 transactivation subdomains that bind the CBP TAZ2 (P Wright) and for larger numbers similar to that studied here it could include 14-3-3 targets such as Raf-1 protein kinase and yeast Cdc25 (multiple authors), CFTR regulatory domain (J Forman-Kay), Sic1 (M Tyers) and even phase separation via multiple motifs and multiple modular binding domains (M Rosen). Examining the approaches used to quantify local interactions or the caveats described in these cases from the literature may also be valuable for interpretation of the LC8-LBD interactions. 2) It is equally important to cite examples of transcription factors that are regulated in a tunable manner such as Ets-1 (L McIntosh), as not all are binary on/off and probably many are tunable with mechanisms yet to be described but likely involving intrinsically disordered regions. The novelty of this being the only transcription factor to not be regulated in a binary manner is thus overstated. 3) "we consider a decrease in peak intensity as a measure for an increase in complex formation" and "It should be noted that these Kd values measured by NMR titration differ from those measured by ITC because the loss in peak intensity detectable by NMR is influenced by a number of factors in addition to direct LC8 interaction. These include exchange with neighboring sites, change in correlation time due to dimerization of the dLBD upon binding dimeric LC8, and increased correlation time as LC8 sites are saturated. These Kd values, therefore, identify different behavior of each set of motifs, but do not accurately determine specific motif binding constants." Generally, different Kd values are expected for global (ITC) and local affinities so the local measures should not match the global, even if the local affinities are accurate. The authors should try to calculate a global Kd based on linked local affinities. Importantly, however, the local affinities are not likely to be accurate. In addition to the caveats mentioned by the authors, there is a strong possibility of intramolecular interactions leading to a lower intensity in the free LBD with binding to LC8 disrupting these intramolecular interactions and leading to increase of intensity for some LBD regions. This should be acknowledged and is especially important given the suggestion of "slightly more ordered structure in its C-terminal half" of the LBD. (Note that "ordered" would be better described as "transient", given the overall disordered nature of the LBD.) The differing apparent correlation times for LBD residues depending on distances from direct LC8 binding site(s) on the LBD and from the termini should also be acknowledged (P Wright and J Dyson). The complexity of interpretation of intensities needs to be laid out even if trying to make a simple interpretation. Ultimately, this reviewer is not convinced of the validity of the "two sub-domains" identified based on these different Kd and cooperativity values, due to the lack of ability to quantify local affinities from the NMR intensities. 4) Some background information on the nature of LC8 structure and its dimerization interface would be valuable. In particular, how does LC8 dimerization affect the cooperativity of binding? Can numerical models be generated to estimate the effect of dimerization in the context of linked multivalent interactions? 6) What are the estimated cellular concentrations of LC8 at various stages and how would these affect the mixture of complexes between ASCIZ and LC8? What might be the dominant complex of LC8-human ASCIZ in cells based on the binding parameters determined in this manuscript? What would be the minimum number of LC8 to inhibit transcription? How is the affinity or kinetics comparable to the transcriptional activator? 7) Given the high level of multivalency in the system with 11 binding motifs and a dimeric binding domain (see work of M Rosen), it seems possible that puncta or large-scale associated states may be observed in vitro or in cells. Is there any evidence for this? Thank you for submitting your revised manuscript "Multivalency regulates activity in an intrinsically disordered transcription factor" to eLife for consideration. Your article was reviewed by the same reviewers as for the previous submission. All three reviewers were impressed with the amount of new biophysical data added to the paper that considerably improved the characterization of this complex system. It was also felt that the literature was reviewed much more thoroughly this time and the current work framed in a better context. The consensus was that the biophysical characterization of a difficult system was strong, while the in-vitro and cellular experiments to prove the hypothesis regarding the feedback mechanism regulating expression were weaker. At issue is that while the overall trend regarding binding and activity is consistent with your claims, the effect is small (Figure 7D) and the errors are large, and in some cases it appears that the differences in the points corresponding to different Kd's are not statistically significant. It was the consensus of the reviewers that a revision should focus more on the biophysics, while suggesting biological relevance through the presentation of the transcription data. If possible, additional transcriptional experiments that attempt to decrease errors to strengthen this section would be recommended but are not required. Please provide a detailed point-by-point response to each of the issues raised below to assist the reviewers in an evaluation of your revised manuscript. 1) As mentioned above the authors present an interesting and extensive biophysical study that characterizes the negative regulation of a transcription factor through binding of a main target protein. The reviewers feel that this (the biophysics) should be emphasized more strongly in a revised manuscript. It would strengthen the paper considerably if the errors associated with the transcription data of Figure 7 could be reduced, but this will be left at the discretion of the authors. 2) In the third paragraph of the subsection “Structure and Distribution of LBD:LC8 Complexes Visualized by Single Particle EM” the authors state that high order oligomers are rare with fully formed complexes almost never observed. Yet in their model of Figure 8 they propose that under high concentrations of LC8 a fully formed complex is formed. There seems to be a discrepancy here. Further it is hard for this reviewer to understand the role of negative cooperativity. If in fact the complete binding range is not used (i.e., one does not get fully bound transcription factor) then it seems like the full dynamic range over which changes in LC8 concentration occur is not optimally sampled by ASCIZ. What is the biological significance of the negative cooperativity, such that the full number of binding sites are not utilized? This seems not to be a very sensitive way of monitoring LC8 concentration. In the previous review, dated July 31st, 2017, all three reviewers agreed that this is a fascinating system of high impact. Yet there was some reservation about publication in eLife in its current form and reviewers suggested several ways to strengthen the work. In this revision we address all the reviewers concerns and add substantial amount of data that considerably strengthen our model. Briefly, the new data include negative stain electron microscopy that give a structural view and quantitative distribution of the multiple disordered complexes in dynamic equilibrium (Figure 5 and Figure 5—figure supplement 1). Negative stain electron microscopy is particularly challenging for disordered systems and therefore the work here pushes the limit of this technique. New data for characterizing the dynamic intermediate were also obtained using small angle X-ray scattering and gel filtration (Figure 4 and Figure 4—figure supplement 1). We have collected significantly more NMR data (Figure 6 and Figure 6—figure supplement 1) and changed the Introduction (Figure 1) and interpretation of the model (Figure 8). As a result, this manuscript is much more focused and we hope is now suitable for publication in eLife. Below we briefly address the reviewers’ major concerns. […] 1) The authors show by NMR that as a function of titration signal is lost due to exchange and increase in molecular weight. The major insight by NMR is that there are two different classes of binding regions that bind either 3 or 4 LC8 dimers with different affinities. Yet little mechanism into binding order to sites within these classes is obtained and as the authors mention the affinities are very different from ITC. Can the authors look at say smaller constructs that contain only 3 or only the 4 dimer sites in an effort to circumvent the issue with disappearing peaks? Indeed even smaller constructs would allow to address whether at low stoichiometries there is preferential binding to one of the sites, whether there is exchange between sites and what both the kinetics and thermodynamics might be. NMR titration data of two smaller constructs that contain only 3 binding sites are now included (Figure 6B, C). NMR titration of the smaller constructs substantiates our data from the full-length construct, which demonstrate that the C-terminal sites bind first. Excerpts from the manuscript are below. We agree with the reviewer that this binding behavior is unusual and surprising. Because of this we have performed every experiment conceivable to verify and rationalize this apparent discrepancy between ITC and AUC. While high occupancy complexes are evident in AUC profiles, consistent with the ITC results, these complexes are in equilibrium with many smaller sub-saturated species, the most highly populated of which is a mixture of 1:2-1:4 complexes of dLBD:LC8. The low occupancy complexes are favored, relative to higher occupancy complexes, even in samples having a large excess of LC8. The presence of stable, low occupancy complexes is supported by new small angle X-ray scattering (SAXS) data, negative stain electron microscopy, and gel filtration. Importantly, also new to this submission, we show a similar behavior for human ASCIZ, and discuss that negative cooperativity in the transition from low occupancy to high occupancy complexes is a conserved feature of ASCIZ-LC8 interactions and explains the higher population of the low occupancy complexes. The completely revised discussion speculates on the biological ramifications of the ability of ASCIZ to undergo both positive and negative cooperativity. In the AAA 8-11 construct, removal of 4 sites decreases transcriptional activity, rather than increasing it as one would expect. We now state in the text that this is likely due to the higher affinity of the AAA 8-11 construct for LC8 relative to WT. All of the other AAA mutants show a decrease in binding affinity that is correlated with an increase in transcriptional activity. Therefore, despite the unexpected result where removing LC8 sites decreases activity, it in fact fits the trend perfectly (see Figure 7D, a new figure in this submission). Evidence for duplex formation comes from a 17+ years of research by the authors on LC8 and its partners, summarized now in the Introduction and Figure 1. Also, in this work, several pieces of data support this interpretation: molecular weight of the complex from AUC, binding stoichiometry from ITC, and negative stain electron microscopy images. The negative stain electron microscopy data are new to the revised manuscript and provide a clear image for duplex formation. […] Much more extensive in vitro and in cell data would be needed to establish the LC8 concentration dependence of the negative feedback circuit and further data required to elucidate the associated mechanism of feedback. We realize that our original hypothesis was not fully supported by the available data. The original hypothesis has been altered and now states “ASCIZ and LC8 engage in a dynamic equilibrium of multivalent interactions that tune the level of ASCIZ transcriptional activity.” Additional data is included in this manuscript to support our hypothesis. Using a combination of methods that include SAXS, AUC, gel filtration, native gel, and negative stain electron microscopy, we demonstrate that both the human and Drosophila proteins form a dynamic complex with LC8. Our cell culture transcription assays show a gradient of ASCIZ activity that depends on the number of LC8 dimers bound. We speculate that this dynamic complex is important for fine tuning ASCIZ transcriptional activity. This work will be of particular relevance to the NMR, intrinsically disordered proteins and transcription regulation communities as it is transformative on several fronts: 1) it presents an attractive model that begins to explain how the concentration of an essential hub protein is maintained in the cell, 2) it gives a unique demonstration of how protein disorder and multivalency, conserved among species, regulate transcription, 3) it presents an example of a multivalent protein that undergoes both positive and negative cooperativity where binding of short peptides and longer constructs is quite different from binding of full length domains, demonstrating the importance of biological context, 4) it combines structural analysis with cell-based mutational and transcription activity analysis of the human ASCIZLC8 interaction that supports the model inferred from structural studies, and finally, 5) it pushes the envelope in the complexity and disorder of systems studied by both NMR and negative stain electron microscopy, and presents a model methodology for similarly complex systems. While we definitely recognize the value in reducing the error bars associated with our transcription activity assays, we do not think that repeating the assays would produce significantly better results because of the small changes observed between each sample. We have performed this assay many times and while the overall trend seen in Figure 7D is always consistent, the size of the error bars are as well. In the revised manuscript, we have placed a greater emphasis on the biophysical characterization of the ASCIZ-LC8 interaction and the transcription data is presented to give weight and biological relevance to our hypothesis. Changes to the text can be seen in the last paragraph of the Introduction as well as the Discussion section. 2) In the third paragraph of the subsection “Structure and Distribution of LBD:LC8 Complexes Visualized by Single Particle EM” the authors state that high order oligomers are rare with fully formed complexes almost never observed. Yet in their model of Figure 8 they propose that under high concentrations of LC8 a fully formed complex is formed. There seems to be a discrepancy here. It is true that high order (7+) oligomers are rare in comparison to low occupancy complexes. However, high order complexes of dLBD and hLBD bound to LC8 are formed in solution, as demonstrated by AUC (Figure 4), native gel (Figure 4), and negative stain electron microscopy (Figure 5, Figure 5—figure supplement 1). The language in the third paragraph of the subsection “Structure and Distribution of LBD:LC8 Complexes Visualized by Single Particle EM” has therefore been modified to state that these higher order oligomers are rare in comparison to the low occupancy complexes. While these high occupancy complexes are scarce, they are observed in every experiment. Further it is hard for this reviewer to understand the role of negative cooperativity. If in fact the complete binding range is not used (i.e., one does not get fully bound transcription factor) then it seems like the full dynamic range over which changes in LC8 concentration occur is not optimally sampled by ASCIZ. What is the biological significance of the negative cooperativity, such that the full number of binding sites are not utilized? This seems not to be a very sensitive way of monitoring LC8 concentration. This is an interesting point that highlights the unique aspects of the ASCIZ-LC8 interaction. The combination of positive and negative cooperativity that we observe leads to the formation of a dynamic mixture of low occupancy ASCIZ-LC8 complexes. The first few sites bind with positive cooperativity and binding thereafter becomes negatively cooperative, forcing the complex into a low occupancy state. These low occupancy complexes are a mixture of different stoichiometries that range from 2-4 for both dASCIZ and human ASCIZ. While all 11 LC8 binding sites do not interact with LC8 in a linear fashion (i.e. occupancy does not increase linearly as LC8 concentration increases), the full number of binding sites are utilized. All sites interact with LC8, as demonstrated by NMR titration of dLBD with LC8 (Figure 6), but due to negative cooperativity, this interaction results in a heterogenous mixture of low occupancy complexes. We propose that a population of low occupancy complexes is important to maintain a stable pool of cellular LC8. Instead of progressively binding more LC8 as it becomes available, our model suggests that ASCIZ’s multiple sites function as a “buffer” for LC8 concentration and aid in maintaining a homeostatic concentration. For example, an increase in LC8 cellular concentration would cause a small shift in the complex equilibrium towards a higher occupancy state and a corresponding decrease in the level of transcription, instead of causing a large change in both. Our transcription assays corroborate this idea, demonstrating a small change in transcriptional activity when the number of available binding sites changes (Figure 7). As LC8 is a ubiquitous protein that binds to hundreds of partners, the need to maintain a stable level of LC8 is likely necessary. The authors are indebted to Professor Clare Woodward for the many helpful discussions. This work was supported by National Institutes of Health Grant GM 084276 to EB and by an Impact Award from the College of Science at Oregon State University. Support to facilities includes the Oregon State University NMR Facility funded in part by the National Institutes of Health, HEI Grant 1S10OD018518, and by the M. J. Murdock Charitable Trust grant # 2014162. Access to the NMR facility of CEITEC Masaryk University was provided by iNEXT, project number 653706, funded by the Horizon 2020 programme of the European Union. This article reflects only the author’s view and the European Commission is not responsible for any use that may be made of the information it contains. JH was supported by the National Health and Medical Research Council of Australia (Senior Research Fellowship APP1022469 and Project Grant APP1026125) and Victorian State Government Operational Infrastructure Support. Electron microscopy was conducted with support from the Multiscale Microscopy Core (OHSU), Advanced Computing Center (OHSU) and the National Institutes of Health Grant R35GM124779 to SLR. Small angle X-ray scattering data were collected at the European Molecular Biology Lab in Grenoble, France. © 2018, Clark et al.